I Will Teach You To Be Rich: Cheap people care about the cost of something. Frugal people care about the value of something. The Simple Dollar: a cheap person will always take the route of least financial cost in the here and now”, while “a frugal person seeks to find the best deal on an item that meets the desired level of quality. I’m often looking for ways to be more frugal – it’s a by-product of having a reduced income significantly over the last 6 months. As such, when there’s an option to save some money, I generally look to do it. This often means avoiding Whole Foods and going with store brands from Safeway. Or it may mean wearing out some of the clothes that I have before I look to buy new ones. Somewhere along the way, I think I crossed the line from frugal to cheap. You see my wife came home yesterday with a new purchase. It looked to be about $5 worth of hair clips. She showed all of three of them to me. I imagine my reaction mirrored most husbands reactions to their wife’s fashion (“That’s nice dear…”). Later that night, my wife confessed that she thought I’d say something about the cost of the hair clips. I’m still a little surprised. If my wife thinks I might react in a manner that I would consider cheap, does that mean I might have reacted that way in the past? Without having the above definitions of frugal and cheap available to me, I tried to explain the difference. I said that when you have long hair, hair clips can be a necessity (and in fact, they were since her other ones broke). That doesn’t mean you go to Tiffany’s and get a diamond encrusted hair clip – I would have been upset by that. I believe in purchasing things that perform a necessary function. Of course, now that I say that she’ll probably pipe up in the comments where I was indeed much cheaper than I should have been. And if I am cheap, perhaps I’m not the only one straddling that line. If I were you, I wouldn’t tell her that she can buy hair clips because she has long hair. 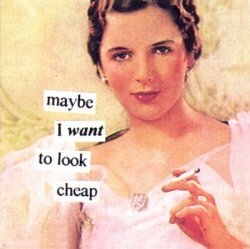 That WOULD make you cheap, because it would mean in your mind you are judging every little thing she buys. @ESFG: That’s the point. I didn’t say anything of the sort, but from my reactions to $5 soups from Whole Foods (because it’s more convenient than the other places, not because it’s actually better) she assumed the hair clip thing. What a great simple definition! I think that most people would probably prefer to be frugal but it definitely takes more effort. Cost comparison is time-consuming when you have to consider more factors than just the immediate price of the item. I imagine it pays off in the end, though! Ill admit it — I have crossed the line from frugal to cheap. I just hope I can cross back at some point. I’ll admit I’m cheap in certain situations but never in others. For example: when I travel I am most definitely not cheap. Traveling is something I enjoy and it’s the reason I’m cheap in other areas of my life. When my fiancee and I go out to dinner (which isn’t often) I’m not cheap either””that’s when I just go out and order what I want and enjoy myself. Responding to Tom, I think the biggest part of cheap is when you know you’re buying unreliable, lower quality stuff. We were trying to be frugal by trying out generic Mach 3 knockoffs from CVS. Normally CVS is cool, but not this time. It’d be cheap if we bought them again, or if I were always talking to Micah about how expensive it is for him to shave (which it’s not really). In your case, you were experimenting…and maybe it was cheap if you had reason to believe it wouldn’t be as good, but maybe it wasn’t. But I know that I probably cross that line on other things. Mrs. Micah: How I saved money on razors. So the question here is not “am I cheap” but “does she think I’m cheap,” right? In other words, what led to this line of thinking is that she was surprised when you didn’t fret about the cost of the hair clips? Uh oh. This is big. Lordy, this is the WIFE here, not some free-spending drinking pal. As an amateur marriage counselor whose advice is worth about what you’re paying for it, I’d suggest the two of you need to sit down and talk about what each person thinks of as “cheap” and what as “frugal,” and figure out your respective comfort levels with these concepts. Then work together to come up with a strategy that keeps you on target financially without having either person feel deprived. By that I mean “deprived” either of purchasing power or of opportunities to save money. Bet you can find a happy medium together.